Printable freezer labels for Silver Dollar Pear Pancakes. 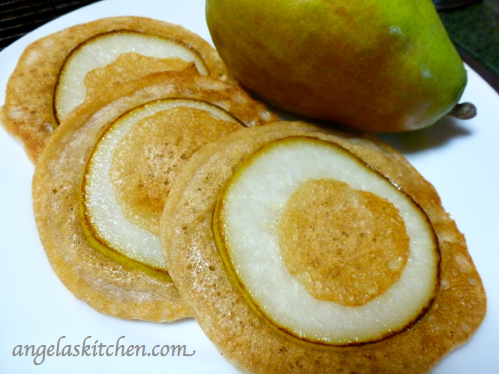 Printable recipe cards for multiple batches of Silver Dollar Pear Pancakes for the freezer. Whisk the dry ingredients together in a bowl. Mix the wet ingredients together until blended then add to the dry ingredients. Stir until blended together. Set aside. Core pears with an apple corer. Starting at the bottom, slice pears crosswise into ⅛-inch-thick rings, and toss in a small bowl with maple syrup and cinnamon. Heat an electric griddle to 375° or a heavy skillet until very hot. Brush with oil; wipe off excess with a folded paper towel. Place a few pear slices on the griddle, 2½ inches apart. Let cook 1 minute. Ladle about 3-4 Tablespoons of the batter into center of each pear ring. Using the bottom of a ladle, gently push batter over edges of pears. Let cook until pancakes have bubbles on top and are slightly dry around the edges, about 2½ minutes. Using a spatula, turn pancakes over; cook until golden on bottom, about 1 minute. Repeat with remaining pears and batter. To freeze: Allow to cool or flash freeze. Place in gallon freezer bags and freeze. To serve: Heat until warmed through.